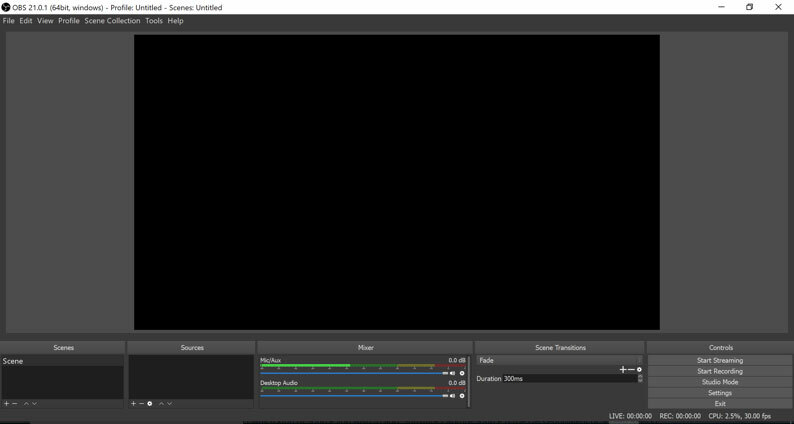 New to streaming and starting from scratch? Do you have a Twitch page? Do you have a JustGiving page? 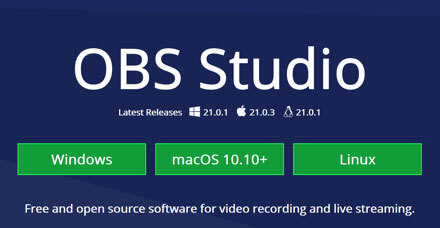 Do you have OBS downloaded? 1. 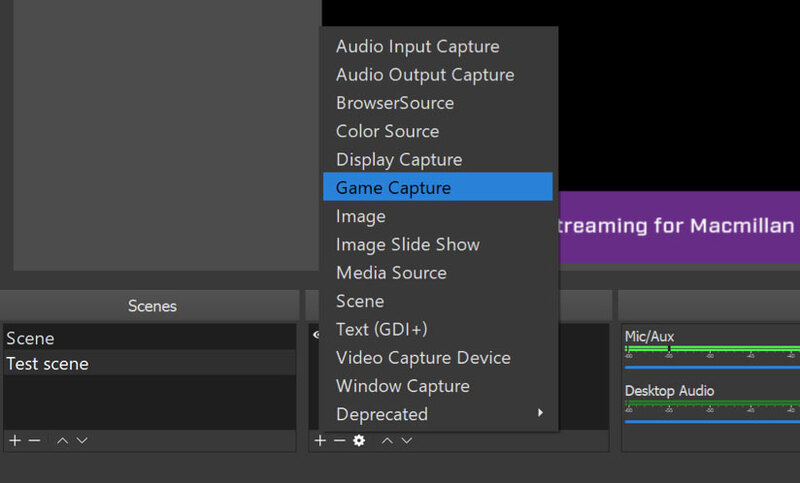 Downloading OBS (Open Broadcasting System) allows you to broadcast your stream. If you skipped to this part of our guide you can download it here. 2. 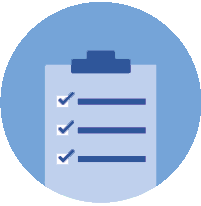 Select your operating system and follow the steps to download and install. 3. You will then be asked to enter your ‘stream key’, you can find this by accessing your twitch account here and on the left hand side panel under ‘settings’ click ‘channel’. 4. 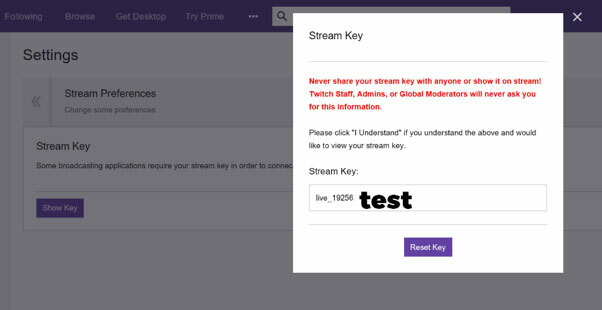 Click on ‘Stream Key’ and then copy the stream key link. 5. Paste this in the prompted box on your OBS server and continue to set up. 6. You will then be presented with your streaming screen template. 7. Next you want to link your ‘Donation progress bar’ and ‘Donation prompt’ so that your viewers and supporters can see how much you have raised and help you reach your target! 8. Click on the ‘+’ button under the ‘Scenes’ tab to create a new scene. 9. Next to this panel you will see ‘Sources’. 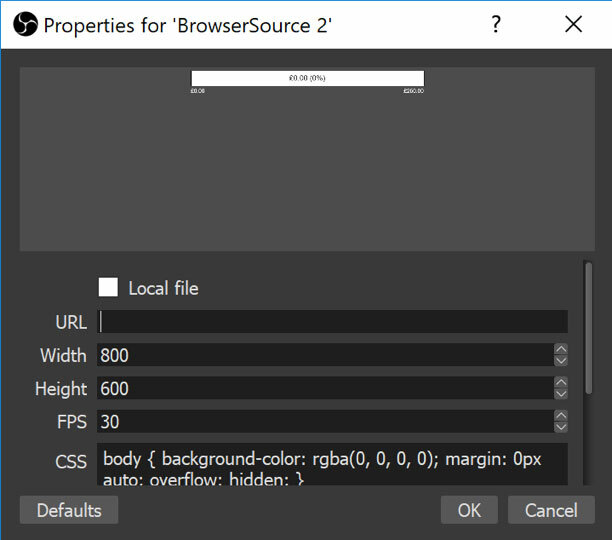 Click the ‘+’ button to add a source titled ‘Browser source’. 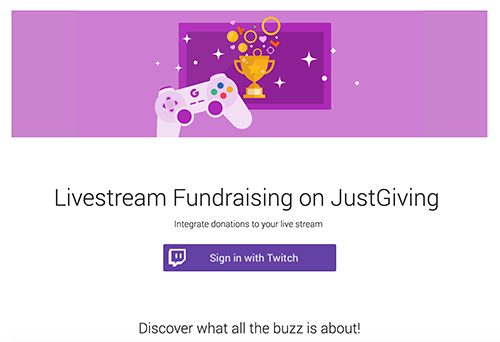 Our Livestream Fundraising tool allows you to link you JustGiving page to your Twitch stream, meaning people can donate to you seamlessly while they watch! 10. The URL you will need to enter can be found here. Click ‘Sign in with Twitch’ to link your Twitch account following the sign in instructions. 12. 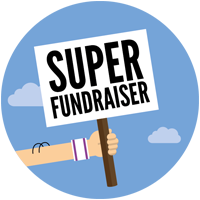 Click on ‘My Fundraising Page’ to link your JustGiving account. 13. 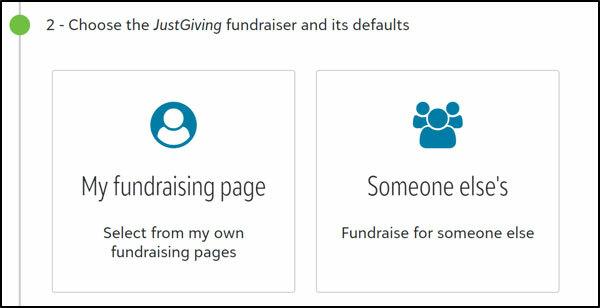 A box will then appear with your Fundraising Pages. Select the one you would like to link to your Twitch account. Click here to create a page if you have not already done this. 14. Next copy the link that is generated in your ‘Fundraiser Progress Bar’ and paste this back into the URL box in OBS. 15. You will then see the donation bar appear and be able to scale/move the object to suit your needs. 16. Repeat these exact steps again but this time add the donation alert link. 17. You can now change the size of each element to suit your streaming – this will be a direct reflection of what users see on Twitch. 18. 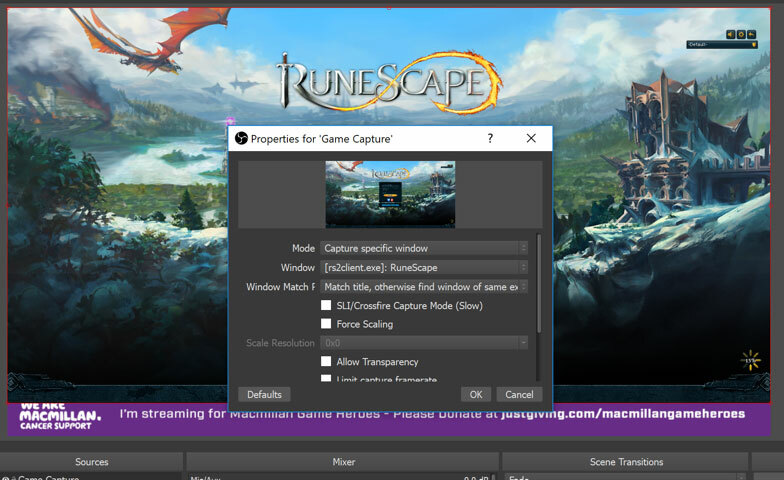 Next you can also add a livestream video of yourself if you want to talk to your Twitch users by clicking on ‘Sources’ and then ‘Video capture device’ – this will stream content directly from your webcam. 19. If you want to really enhance your stream you can also add ‘custom overlays’ (a mixture of image and text that is a great way to have your brand static over the entire stream). The charity you are fundraising for may have templates for this so get in touch and ask if they have a ‘Twitch overlay’ they would like you to use. 20. 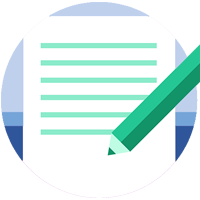 To add a custom overlay your overlay must be saved as a ‘.png format’. Follow the same steps as adding the donation and progress bar by clicking on the ‘+’ symbol under ‘Sources’ but this time select ‘image’. Next select your saved file from your computer, click OK and drag into position. 21. Next you want to capture your gameplay. Make sure that your game is downloaded onto your PC and then launch the game. 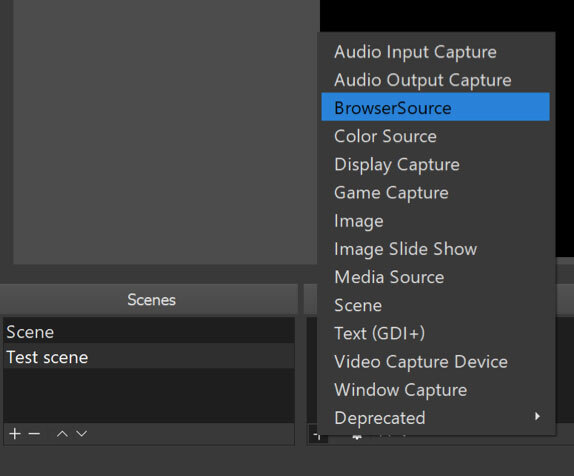 Then click on the ‘+’ button under ‘Sources’ and select ‘Game Capture’. 23. You are now ready to start your live stream! Select ‘Start streaming’ from the bottom right hand panel. 24. Click here to access your Twitch homepage and you will be live-streaming on your channel homepage. To stop or pause your livestream at any time just go back to OBS and click ‘stop streaming’. 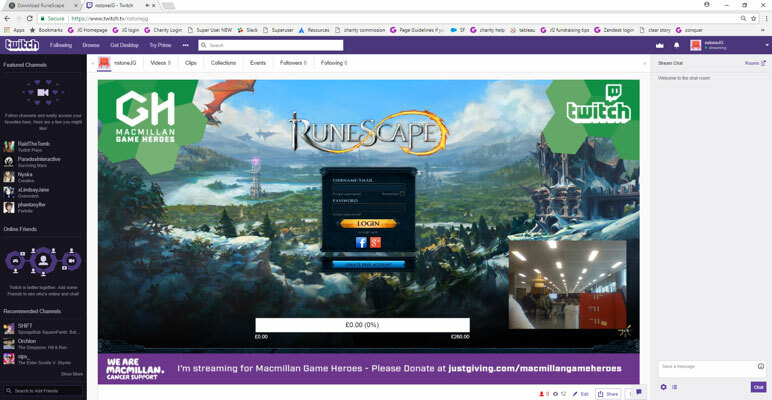 To make it as easy as possible for people to donate you can also add a donation button to the panel under your stream. Click on your channel homepage and click ‘Edit panel’. Add the panel title as ‘Donation button’ and then select the image you want to use. Don’t have a default button? Click here to get your JustGiving Charity specific button! Once you have selected your image go here and copy your ‘donation link’. 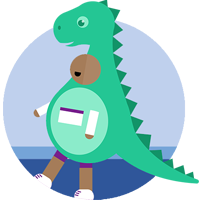 Paste this into the ‘Image links to:’ box on the twitch panel. 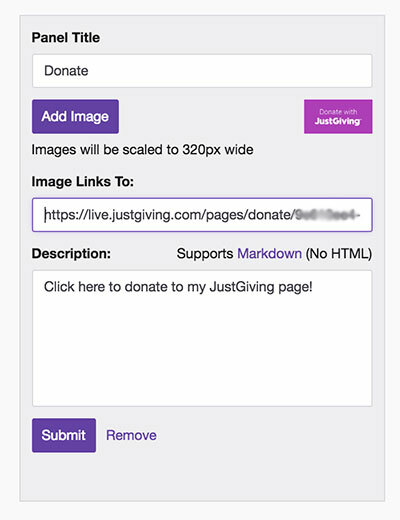 Your button will now take viewers directly to the donation flow of your JustGiving Fundraising Page!